The following examples use ABS data on business activity. We have processed these to integrate them with our postcode GIS data products to present them at postcode level. 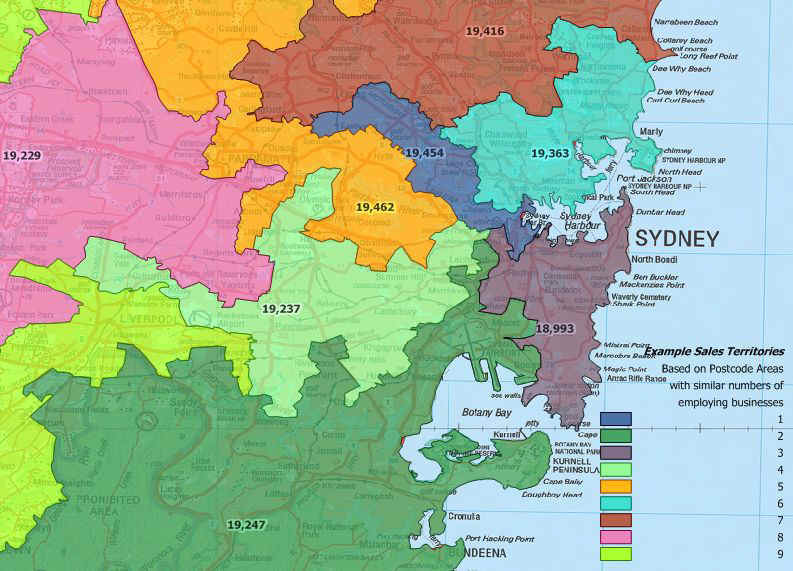 The map below shows the total number of businesses having at least one employee, for postcode areas around Sydney, NSW. Number of businesses with one or more employees – Sydney, NSW. We are sometimes asked whether we can generate sales or franchise territories based on “number of businesses”. The process is similar to that required when using Census demographics. This map is the result of processing MapMakers Postcode area data to include the total number of employing businesses, and generate 9 sales territories, each of which has a similar (and thus fair) number of businesses in it. The numbers on the map show the total number of employing businesses in each territory based on the postcode areas within. We can even analyse for trends in actively trading businesses over time. As always, if you have your own in-house data relating to business activity of specific interest, or wish to compile such data from other independent sources, we could use that in a similar way. Franchise territories using postcode areas, balanced by number of businesses. Of course you may wish to target only business of a certain size. For example a coffee machine leasing operator may feel that their most reliable and well priced machine is ideal for businesses with perhaps 20 employees (though probably too expensive a proposition for a sole trader or really small firm). This map shows where such businesses, employing between 5 and 19 people, are distributed and how many are primarily located in each postcode. 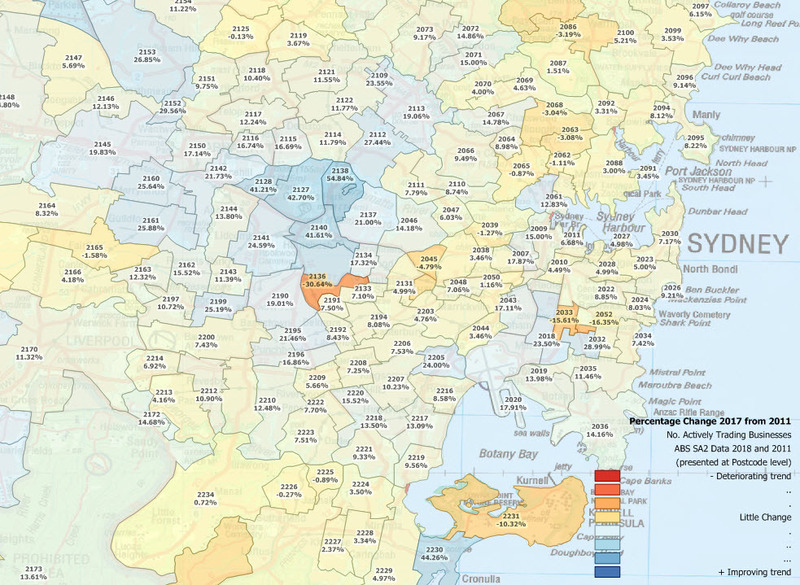 The data could be used in a similar way to the Territory map above, to produce sales territories for potential franchisees. Postcode areas showing number of businesses in each having a specified range of employee numbers. Data is also available for business sector category, and financial turnover. This example combines both these types of data to map the distribution and number of businesses operating in the “Retail Trade” sector, but only those operations turning over less than $150,000 per annum. Map using ABS data integrating business category (e.g. “Retail Businesses”) and annual dollar turnover amounts. There is also a category for “none employing” which can be taken to represent sole traders and other single person businesses. This map shows the distribution and numbers of such businesses operating in the “Personal and Other Services” sector from the default list reproduced above and for the same area as the four previous maps. 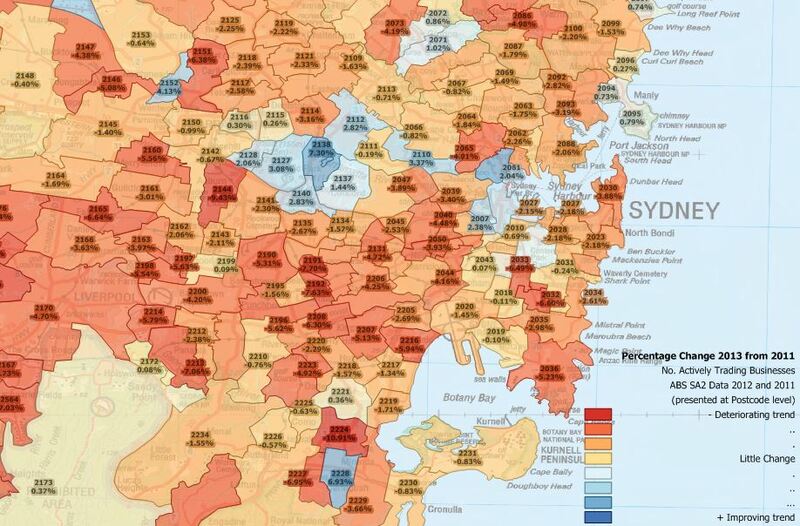 Of course if you are considering undertaking a territory mapping exercise using such data, it is important to feel comfortable with what the raw statistics are likely to represent. As with all ABS data, care is taken to protect the privacy of individuals and businesses, so the user must take some time to consider where the information of specific interest is likely to reside in the general statistics available. In this map, the location of Kings Cross is marked with an “X”, but there are obviously many types of businesses which would be grouped together in the same very broad category of “Personal and Other Services”! Note: The ABS has revised its standard geographical classification. 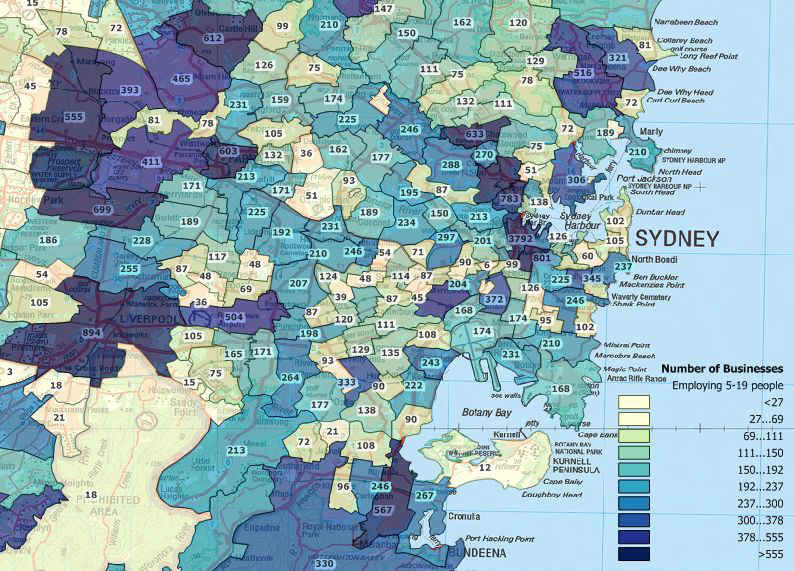 Postcode level data is not available after 2006, with most recent business data (2015) compiled to new standard level, which is of only limited use for most territory planning work. We can restructure these data to a best approximation at postcode area level; this is a custom mapping task and is charged at standard rates. Contact sales with your requirements. We monitor ABS and other relevant site activity regularly and will continue to post updates as / when available (this information last updated August 2015). Map showing number of sole trader businesses in the “Personal and Other Services” category (Kings Cross, Sydney marked with a “X”). 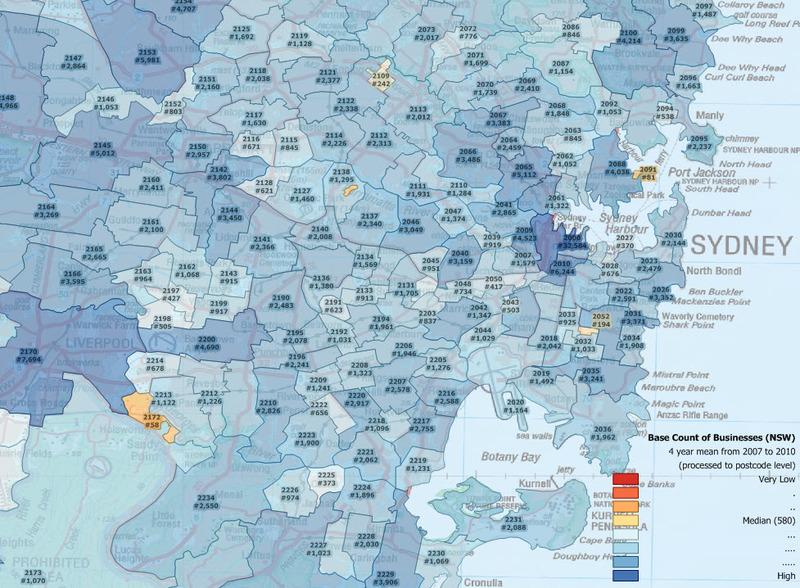 The following maps show the mixed fortunes of the Greater Sydney region, on an annual basis since the current format business count figures were first collated for the four year period 2007-2010, published by the ABS 2011. The first map shows the actual average number of all operating businesses for each postcode for the initial four years – this is the 2011 base line from which subsequent departures will be calculated. 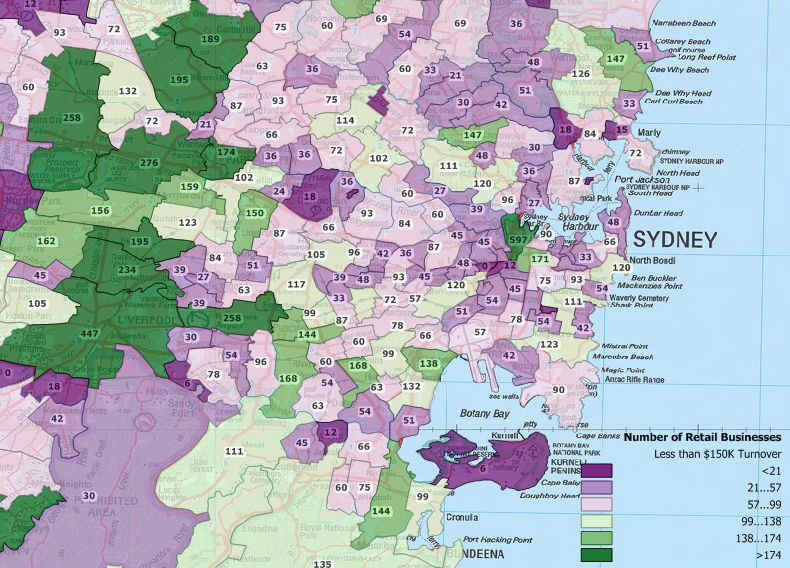 The following example demonstrates processed ABS business count data from 2011 and 2012 but analysed to postcode area level. The two sets of business counts are presented as percentage change from 2011 figures. 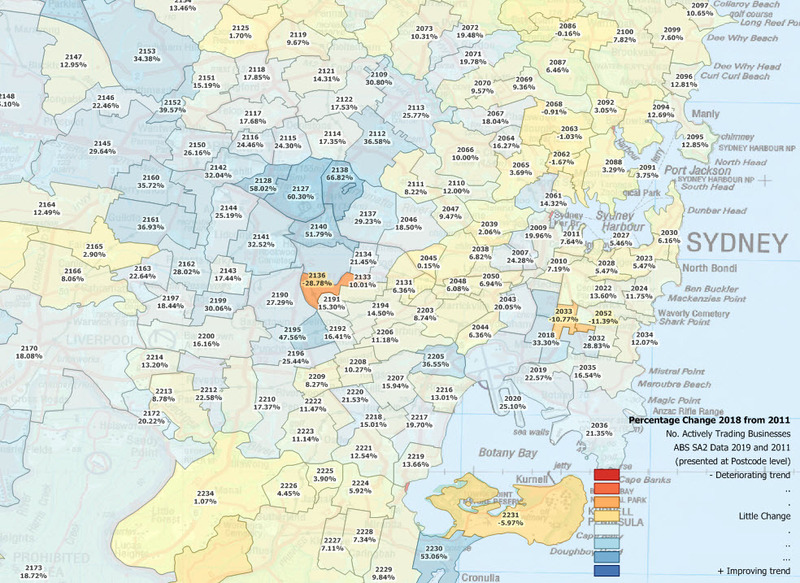 The mean change for NSW plus the ACT over this period was +0.63%. Please note only random postcodes and values are shown in order to remove overlapping labels. Note also the ABS data are four-year averages; for example data published for 2011 includes data for the years June 2007 to June 2010 inclusive. 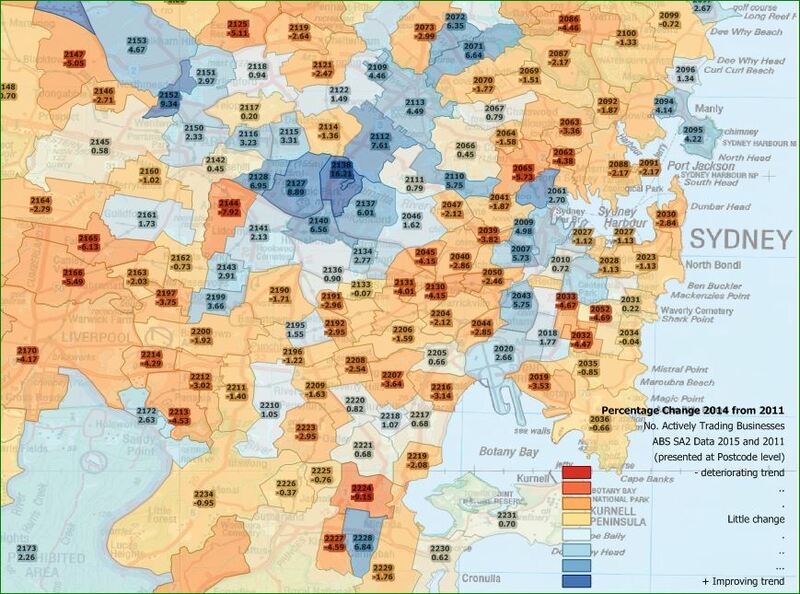 Percent change per postcode 1 year from base level. Immediately below is the result of business activity data published 2014. Using the same starting point as the example immediately above (i.e. aggregate total business activity for four years), this analysis quantifies the change up to 2013 in the same area. 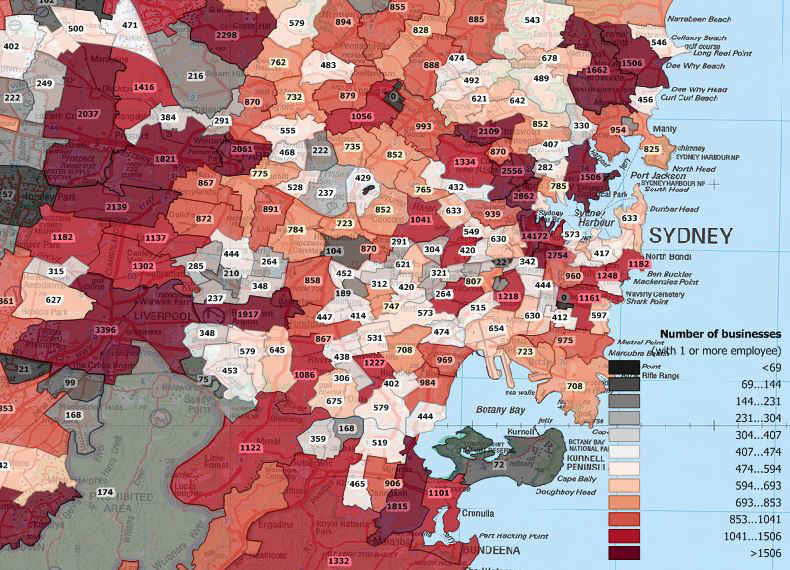 While a few postcode areas have maintained a positive trend in business activity over the period, the 2013 data indicates a clear decline in overall business activity for the majority of postcode areas in the Greater Sydney region, with many previously growing postcodes slipping into decline (impacts from the GFC may be reflected in the data). This is confirmed by the mean change in number of actively trading businesses over the whole of NSW plus the ACT – +0.63% growth in the previous period (above), but a negative -1.45% in this data. 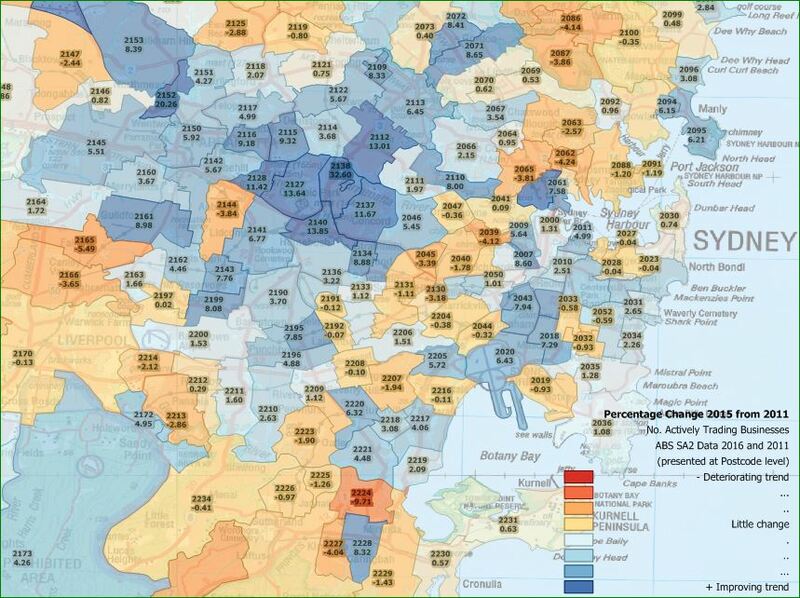 Percent change per postcode 2 years from base level. Released in 2015 is the 2011-2014 business count data. Again we have analysed the numbers and transformed them to postcode level, where most of us can make sense of the patterns. 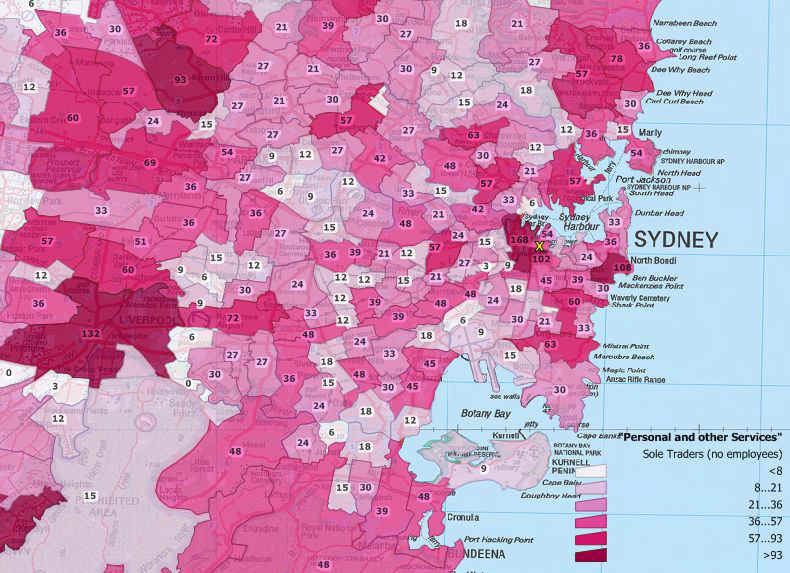 The trend is slightly better than previously, especially for Sydney. The mean change in number of actively trading businesses over the whole of NSW plus the ACT -1.45% in the previous period (above), is a slightly less bad -0.91% in this data. 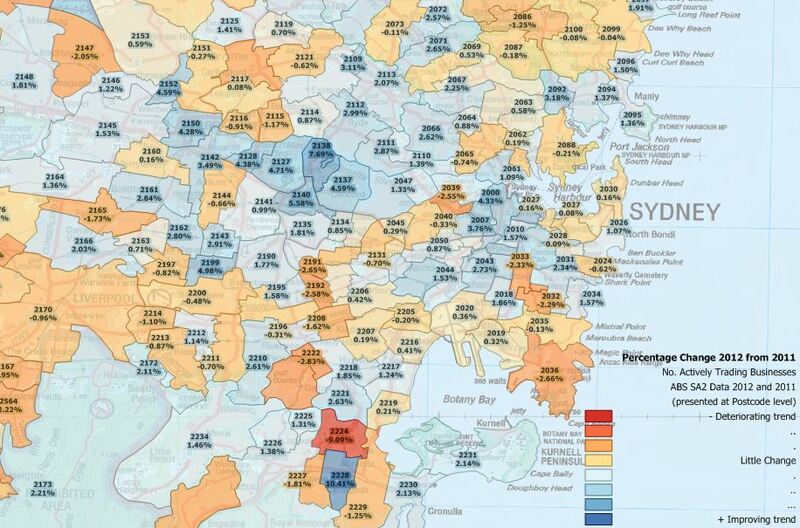 For Sydney postcodes visible in the image the result is -0.23% compared to -0.91% last year. Released mid 2016 is the business count data for the reporting period ending 2015. Repeating our analysis of these SA2 records at our postcode area level, the overall change in number of trading business from the 2011 base level is now +0.16%, so back on track. However the country’s population has increased by about 14% over the same period, with much of the migrant and refugee intake choosing to settle in large cities including Sydney, so per capita business activity may be considered as still negative. 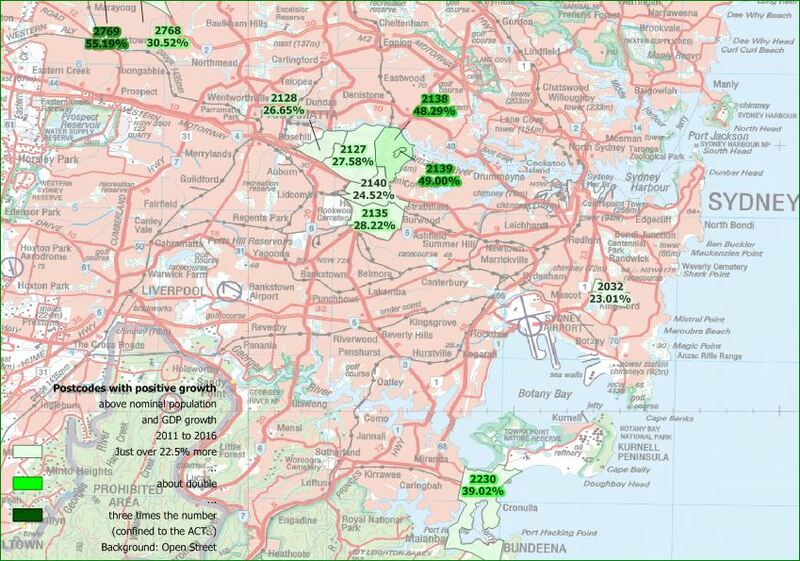 For Sydney postcodes visible in the image the result is +2.46% compared to -0.91% last year. The situation is similar for the business counts for the four year period ending 2016, released by the ABS in early 2017. This is now a five year span from the 2011 base line, so in a static / stable economy, the number of businesses should have increased in broad proportion to the cumulative sum of population change plus base line economic GDP change (5*(2 + 2.5)) = 22.5% anything less suggests some economic upheaval at the level the data are presented. Of course an existing business may expand and still only be counted as a single business. Others may contract, as demand for their services reduces, perhaps as the ethnicity of the postcode changes. If anyone has a better figure for Sydney’s population and GDP growth over this period, suggest it via a comment below and we’ll consider replacing our seat-of-the-pants formula. Here are those positive growth postcodes for the area shown, plenty of support jobs around the Concorde Repatriation Hospital it seems! And here is the percentage change in numbers of operating businesses 2011 to 2017 data released 2018. Here’s an analysis of differences between the rate of population growth and the rate of private business change between the two censuses 2011 and 2016. Anything less than 27% isn’t cutting the mustard (same basis as previous calculation with the addition of another year). Here are those few postcodes which are cutting it. Here’s how the release 2019 (four year average to 2018) data look. 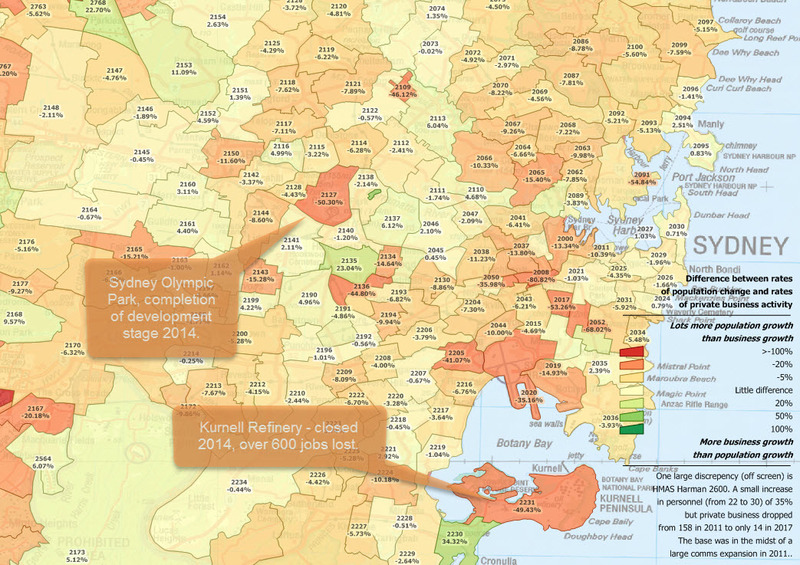 Making the same comparison for one of the nation’s unemployment black spots, we include the same analyses for northern Tasmania here. These analyses will be repeated and the updates posted here when the 2019 period data are released in early 2020.